I don't normally set goals for my cycling but since joining Audax UK at the end of last year I've had one clear goal in mind – to ride 200k. 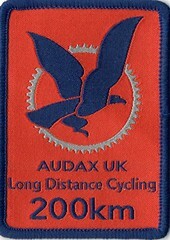 Although AUK validates rides from 50k upwards, 200k is really the basic Audax distance – it is 'the long distance cyclist's organisation' after all and 100k rides don't really fit that description. You are not a 'proper' Audaxer, a Randonneur, until you have ridden 200k. I wasn't so much worried about completing the distance as getting totally lost a long way from home! I thought the easiest way to solve that problem would be to build up to cycling twice round the Isle of Wight – 200k and no risk of getting lost. I thought if I rode round often enough I would reach a point where I would feel that I could happily go round for a second time. Its not happened yet! The Isle of Wight is hilly (worth 1.5 AAA points if you're interested in that sort of thing) but also it would be just doing the miles for the sake of it, no new places to explore. The New Forest route offered a mix of familiar and new places and is mostly fairly flat. Just the job! I've always stuck by the Girl Guide motto of 'Be Prepared' and I spent many a long hour thinking about this one – what to take, what to eat and how to avoid getting lost. I rode my first Audax with a friend a few years ago and we made a complete mess of it, losing the route and adding about 15 miles with our 'shortcut' to get back on it. We should have spent less time gossiping and more time concentrating on the route sheet but its left me with a deep worry about navigating my way round a route. I couldn't afford to add any extra miles this time. With a little help from Patrick I uploaded the GPS file onto my Etrex and then spent ages working out the best way to attach the route sheet to my handlebars as well. Following the big purple line on my GPS did sound as if it would be simple enough but I was taking no chances. Besides, although the GPS showed the route it did not show the controls, and I was very anxious not to miss any. After a lot of experimentation I attached a bulldog clip to my handlebars with a velcro strap and this worked beautifully to hold the routesheet. I highlighted the controls and then sealed all 3 sheets in plastic bags. But what if it blew away, then what would I do? I printed a spare copy and put it in the bottom of my saddlebag just in case. I also cut the relevant section out of a road atlas and then, to complete the belt and braces approach, I added OS Tour Map 7 as well! Finally to make doubly, doubly, sure I went over to the New Forest and rode the last 45 miles of the route! Some of my preparations were a bit OTT but I was very glad I did this one. It was a lovely ride in much better weather than we had on the day (I'm afraid I forgot to take my camera which was a shame) and meant that I was confident that no nasty surprises lay ahead in the last miles. So, what to take? Should I go for the kitchen sink approach or try to travel light? There was a thread on Yet Another Cycle Forum on this subject (although intended for longer rides) and some people were adamant about never taking any food. 'You are never more than 40 miles from a shop anywhere in England' it said. 40 miles? I could get very hungry in 40 miles! I wouldn't rule out starving to death! I'm obviously not ready to join these hard men. I stuck with Plan A – large saddlebag and jersey pockets stuffed with food and nibbles. As the day approached I studied the weather forecast anxiously. At the beginning of the week everything looked rosy but as Sunday came closer so the forecast nosedived. It would start off bright and sunny but would soon cloud over and turn wet and windy by afternoon. They were spot on and I was very glad I'd taken a full complement of waterproofs. And so the great day dawned. The ride started at 8.00 which meant catching the 6.35 ferry and a 5.00 am start. Dennis valiantly drove me over there and then spent the day on the mainland – he wanted to be on hand to rescue me if necessary! I ate my usual muesli in the car waiting for the ferry and then followed this with tea and toast on the ferry. When I arrived at the start I was immediately offered chocolate biscuits and bananas so I ate them too. I was taking no chances! There were roughly 35 of us on the 200k event plus another 17 on the 160k which followed the same route. I set off at a comfortable pace and remained part of a small group most of the way to the first control at Cranbourne Garden Centre. I had spent ages deliberating whether to take a flask before finally deciding against it. The cafe staff were very pleasant but very slow and as I waited 20 minutes for them to produce a pot of tea I really regretted leaving the flask behind. Still, it made me feel a bit less guilty about surreptitiously eating my sandwiches while I waited! The route had been fairly familiar up until this point but I was now heading into unknown territory and was slightly apprehensive as I headed off from the cafe on my own. I was very glad of my GPS and its comforting purple line that confirmed I was going the right way. It was a beautiful route through small lanes lined with bluebells and wild garlic and the trees in their fresh spring green. I rounded a bend and came on an unexpected hazard – a traction engine puffing and rattling its way to a nearby steam fair. I was stuck behind this for a while and made my only navigational error when I mistook a bend for a right turn – the traction engine was blocking my view. I realised the mistake within a few yards (thank you GPS!) and was soon back on track. The lanes eventually gave way to the open heathland so characteristic of the New Forest. These areas are very open and exposed and unfortunately there was now a strong headwind. Ahead of me I could see a guy in a YACF jersey and knew he was part of the event so I upped my pace to tuck in behind him for a bit of shelter and moral support. There was quite a steep climb here too which caught me rather by surprise. I was looking forward to the shelter of the wooded section and the descent of Rhinefield Ornamental drive into Brockenhurst but it was a long time coming! Finally we swept over the dry ford and into Brockenhurst where ponies and Highland cattle were wandering along the main street. I'd covered about 75 miles and stopped for a quick drink and a Nutrigrain bar as I picked up my sticker from the control in the bike shop. From now on I felt I was on the home straight. I know the area round Brockenhurst and Beaulieu fairly well and then I would be onto the area that I had previously reccied. 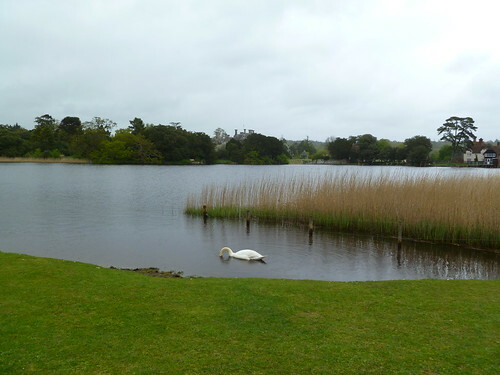 I was feeling good as I set off towards Beaulieu in light rain. It was soon raining steadily and I stopped in Beaulieu to put on my waterproofs and took a couple of quick snaps – they're not very good I'm afraid. 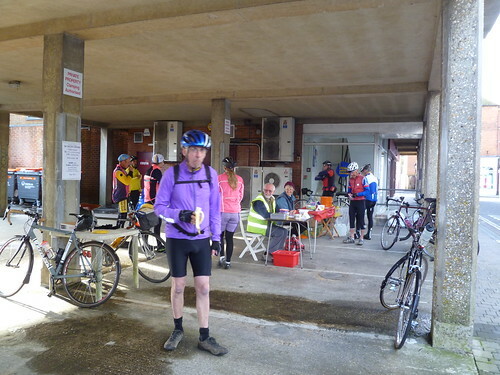 I was now looking forward to the cafe stop at Lepe Beach. In fact I was so fixated on getting a pot of tea that I would have forgotten to collect my sticker if the lady behind the counter hadn't reminded me! 2 mugs of tea and the rest of my sandwiches later I headed out to find that it was now absolutely tanking down and very windy. This was where the 160k riders headed for home. Give up now? Not likely! I've started so I'll finish! When I came this way on my recce I thought the next section along the coast looking across to the Isle of Wight was absolutely delightful. It wasn't now. It was vile! A strong wind from the sea tried to blow me across the road and the rain came down in stair rods. Fortunately once I turned inland and back into the shelter of the trees it improved considerably and the rain actually eased off. That was a relief – I didn't fancy another 35 miles like that! The next control was at a cafe in Minstead and I knew from my recce that they closed at 5.00. They would leave the stickers in a jar outside if they were closed but could I manage without another cup of tea? I decided I would be fine with the free sample 'go faster' energy drink I still had in my bottle. I was glad I hadn't been looking forward to tea, I arrived at 4.59 and they were very definitely closed. I stopped for a brief bite to eat and was joined by another rider so we rode the final miles together, both glad of each other's company. Another exposed open area lay between Lyndhurst and Beaulieu and I was dreading having a strong headwind on this section. It was certainly bleak – wet, grey and misty and we both had our lights on but the wind was actually behind us and we headed back to Beaulieu at a good pace. I kept expecting that I would start to flag and was delighted to find that I was still going strongly right to the end. We collected the final info control, rode over the last cattle grid, past the Isle of Wight ferry, and into Lymington and the finish. Organisers John and Sheila Ward had laid on a magnificent spread in the Community Centre and I happily devoured soup, pasta, rice pud, sliced peaches and lashings of tea. It had been an excellent day out, I'd enjoyed it from start to finish. Posted by Hilary on May 14th, 2013. My sit bones are hurting just from reading this report. Travelling light ... I have never had that option. Mary's philosophy is to bring as much along as could be possibly needed, and then some extra for backup (especially if it's food). Travelling without food doesn't make sense to me. When hunger sets in, I'm famished, and if I'm famished I can't ride. Good ride, Hilary, and well done. Well done indeed. And Dennis for being on hand. GPS is ideal for this sort of ride. I'm pleased you managed with it Hilary. They are a real time-saver when you are cycling but can take a while to become second nature. You can add the controls as separate waypoints that don't affect the navigation line but appear on-screen when you get close. I have used waypoints to mark B&Bs so that when you arrive in a town via the wiggly line you then use a waypoint as "Go To" navigation (after a bite to eat of course). I know the area a little bit. There's a nice café in Beaulieu called Steff's Kitchen if you are there again, and I think Beaulieu Lake is Hatchet Pond – it looks familiar anyway, and it was Hatchet Pond that we passed. I was delighted to have no problems in that department, I have occasionally had saddle sores on shorter rides. I applied liberal quantities of chammy cream before I set off and took a small sachet with me just in case but no problems at all. I liked the GPS and routesheet combination. The people relying solely on GPS were the ones who kept overshooting the controls! How do you persuade the GPS to only record the time you are on the bike and not invent a time and a route for itself for the time the bike was in the car and ferry? It doesn't affect the navigation but it makes nonsense of the ride statistics. 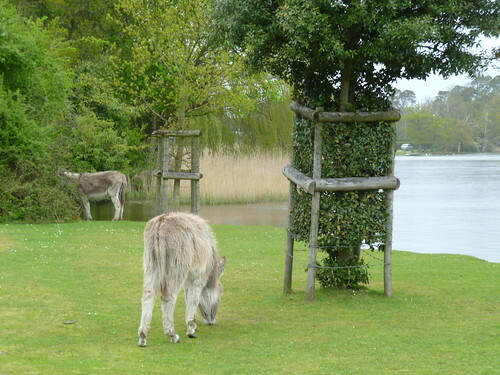 It is Beaulieu Lake looking across to the abbey. Hatchet Pond is a mile or so back towards Brockenhurst. I can't say that I like Beaulieu, its a pretty place but its always heaving with traffic. It is a bit annoying and confusing how it always seems to be recording when it's on. With my eTrex Legend HCX I go into Menu / Tracks and set the tracklog 'Off' when I don't want it to record. You need to access the Track Log screen and see what's there. The confusing part is that the tracklog is not the same as what you see on the odometer screen which just keeps on running regardless (you can reset the odometer screen data to zero – that will not affect the tracklog). It's the tracklog that matters for recording your actual ride and the Track Log screen should show you a list of tracks that have been recorded when the tracklog was 'On'. Remember that if the tracklog is 'Off' your course will not be recorded for importing to BaseCamp even though there may be ride data shown on the odometer screen. Anyway... to only record the time you are on the bike you have two options: either turn the unit off when you stop (which will start a new track when it's turned on again) or use the Track Log screen to toggle between "On" and "Off" – in either case there is a risk that you will forget to turn things on again when you continue the ride. When you import the tracklog into BaseCamp you can select particular tracks for putting on Garmin Connect, not the whole lot. If the GPS has split one ride into several tracks – as it does sometimes – you can combine them into one in BaseCamp. It's best not to upload everything directly from the unit. Garmin Connect (after you upload to it) filters out time stopped so you can see the details for time actually cycling. The whole thing is confusing at first. It took me a while to get used to it – and now it's fine! 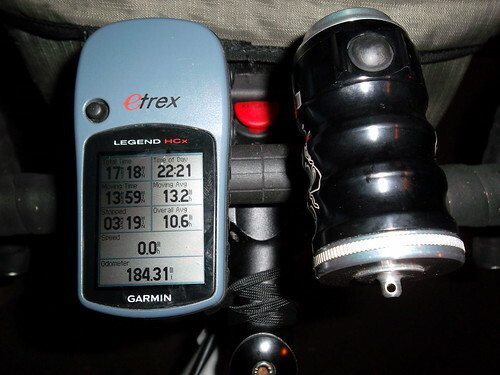 Re the display on your Garmin, here is a photograph of mine when I had got back from what was meant to be a sort-of DIY Audax (that never happened). I have mine set to display these preferences and it gives me everything I need, apart from Max Speed, which I don't actually miss. Have you tried uploading your routes to Garmin Connect yet? The 'Player' feature is useful, I think. Edit: if you compare the photograph above with the route linked to, you will notice that the ride is only 178.64 miles. I had toggled through the options when I got back to Cottingham (where I started Garmin), but let the odometer keep ticking over until I got home. Hence the difference between the two figures (so total for the day was just under 190 miles). The people relying solely on GPS were the ones who kept overshooting the controls! Well done Hilary on your 200km ride. It read like a fabulous ride out. 35 riders! Thats quite a turn out, the organisers will be chuffed with that. Ive always been some what surprised and very pleased for the lovely spreads some organised Audax rides have at the end of them. Especially considering the low entry fee costs. Always much appreciated all the same, in particular on such a long ride. Dont you just LOVE those new badges.